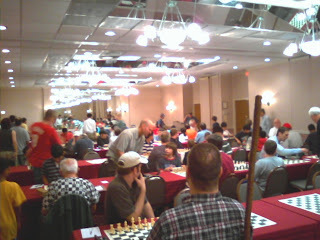 The 62nd annual New Jersey Open is taking place, this Labor Day weekend, at the Ramada Somerset. 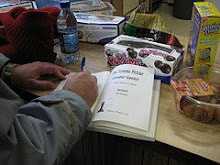 Here are pictures taken yesterday. You will see tournament director Ken Thomas making announcements before the start of round one, from many different angles, while players listen or analyze. 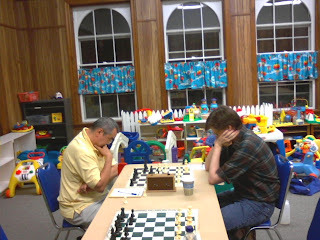 The last photo shows the rook-and-pawn ending to the first round game between Steve Himel and Ron Groseibl. How's this for getting paired against a higher opponent? 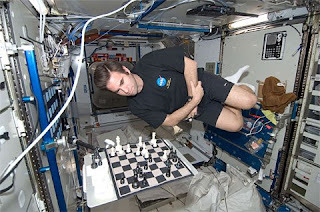 Astronaut Gregory Chamitoff, aboard the International Space Station, is playing six simultaneous games of chess against different Ground Stations. 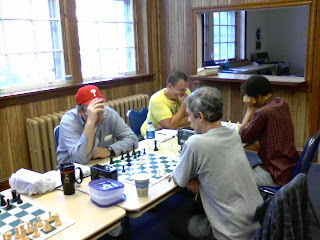 On Wednesday night, the New Jersey Knockouts opened their 2008 season in the United States Chess League with a 3-1-0 victory over the Baltimore Kingfishers. Yesterday I received this e-mail. Contrary to what you wrote on your post about the Marshall CC Swiss, you didn't miss a win in the game against Kelleher after 52.b6, because this position is drawn with accurate play from White. After 52...Ke6 53.Kc6 Rc8+, we arrive at the critical position. I agree that 54.Kb7? Kd7 55.a4 Rc5! is winning for Black. That's why White must absolutely play 54.Kb5! 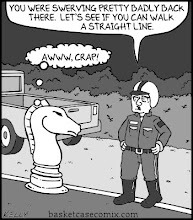 with the threat of 55.b7 winning a tempo on the rook. After normal moves like 54...Kd6 (or 54...Kd7, or 54...Rh8), there follows 55.b7 and 56.Kb6. Such are the joy and pain of rook endings. On a personal note, I take great pleasure in reading your chess blog. Keep up the good work! 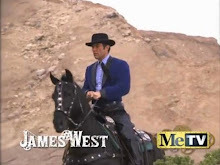 The e-mailer is correct. During the post mortem analysis, my opponent and I were under the mistaken impression that 54.Kb5 would lose to 54...Kd7 55.b7 Rc1. 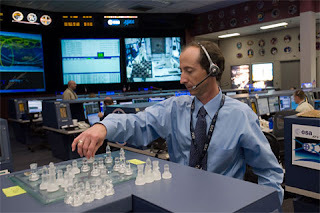 What we overlooked is that White draws by underpromoting to a knight with 55.b8=N+!. 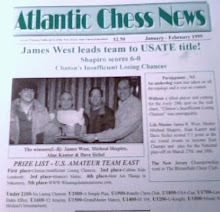 Tonight at 7:15, the New Jersey Knockouts open their 2008 season in the United States Chess League by taking on the Baltimore Kingfishers at Chapel Hill Academy in Lincoln Park. 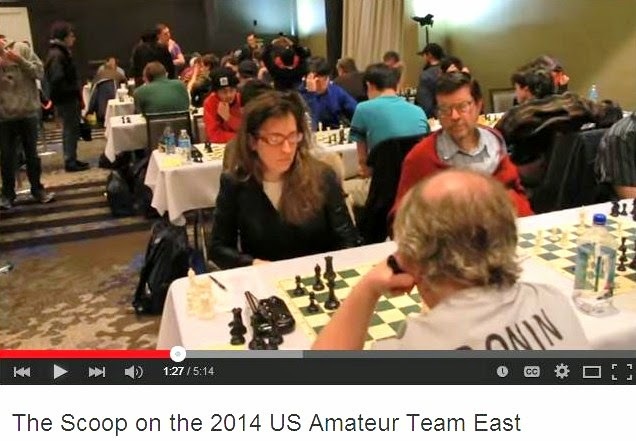 Since last season, grandmaster Boris Gulko and FIDE master Aviv Friedman have been added to the roster of the NJKO. 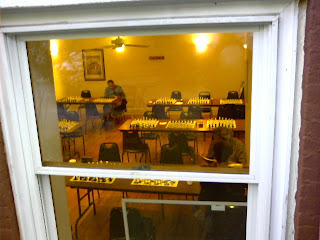 These photos were taken by me on Sunday during the August Grand Prix at the Marshall Chess Club. You will see photos of round one, from inside the downstairs room and the corridor. There are pix of Vladimir Polyakin playing Tony Blum, from inside and outside. 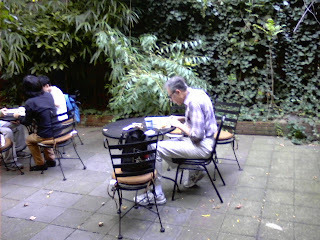 Finally you will see players relaxing between rounds in the courtyard behind the club. 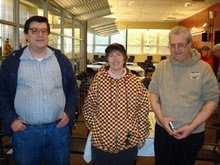 Yesterday I participated in a Swiss tournament at the Marshall Chess Club, finishing with a record of 1-0-3. In the last round, I missed a win by 52...Ke6 53.Kc6 Rc8+ 54.Kb7 Kd7 55.a4 Rc5. 13.d4 Nxd4 14.Nxd4 Bxd4 15.Qxh5 Rxh5 16.Kh2 c6 17.Nc7 Rb8 18.Bh3 Rh6, White resigns. 17.e5 Nxg4 18.fxg4 Bxg4 19.e6 Bxe6 20.Bd4 h5 21.Bxg7 Kxg7 22.Rxh5 Rh8 23.Rxh8 Qxh8 24.Nd4 Bd7 25.Qe2 b5 26.Qxe7 Bg4 27.Nde2 Qh2 28.Rf1 Bf5, draw. 28.a4 Nxa4 29.Nxa4 Rd1+ 30.Kh2 bxa4 31.Kg3 Ra1 32.Rb7+ Kf6 33.Rb6 Rc1 34.Rxa6 Rxc2 35.Rxa4 Rxb2 36.h4 h5, draw. 52.b6 Rc8+ 53.Kb5 Kd6 54.b7 Kc7 55.bxc8=Q+ Kxc8, draw. I took these pictures at yesterday's Hamilton quads. Diamondback is the one wearing a Philadelphia Phillies baseball cap. Why not an Arizona Diamondbacks cap? 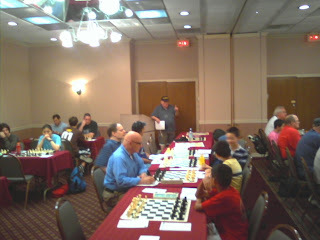 NM Dragan Milovanovic ponders his move, while David Hua looks on. Here is play from quad two. 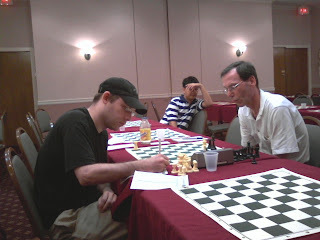 National masters Dragan Milovanovic and Mark Kernighan battle in round three. 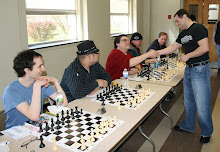 At today's Hamilton quads, I won my last round game against David Hua. 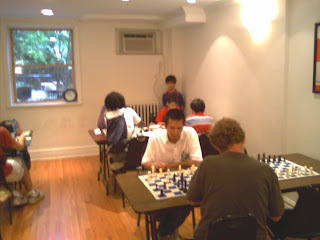 It was the only loss for Hua who drew against two national masters in his prior rounds. 29.h3 Rd6 30.Qe5 Rad8 31.axb5 axb5 32.Qe2 Bd7 33.Bxd5+ Rxd5 34.Rxd5 Bg4 35.Qe7+, Black resigns. 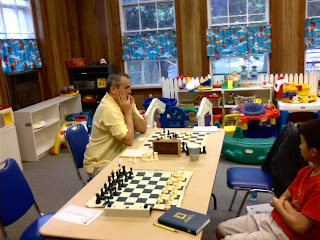 On Sunday, my student Ziping Liu tied for first, at 2-1-0, with Alice Dong in his quad at Westfield. Here is their game from the second round. Instead Benko-Fischer, Curacao 1962 continued 7...c6 8.a4 Nbd7 9.a5 exd4 10.Nxd4 Nc5 11.h3 Re8 12.Re1 Nfd7 13.Be3 Qc7 14.f4 Rb8 15.Qd2 b5 16.axb6 axb6 17.b4 Ne6 18.b5 Nxd4 19.Bxd4 Bxd4+ 20.Qxd4 c5 21.Qd2 Bb7 22.Rad1 Re6 23.e5 Bxg2 24.Kxg2 Qb7+ 25.Kf2 Rd8 26.exd6, and White won in 40 moves. The game is equal and remains so, until White blunders on move 19 when she should have played 19.Rae1. Black has a winning position, and 0-1 in 33 moves. 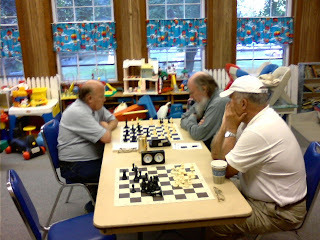 During round one of Saturday's game/60 Swiss at the Marshall Chess Club, I snapped these photos. 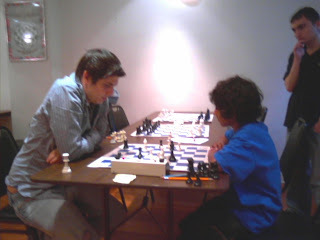 NM Adam Maltese was held to a draw by Kapil Chandran. 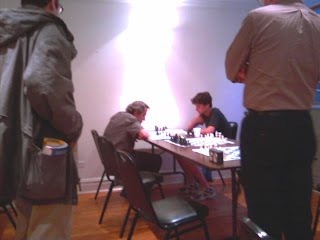 Maltese won his next three games to finish in a three-way tie for first place with IM Jay Bonin and NM Yefim Treger. 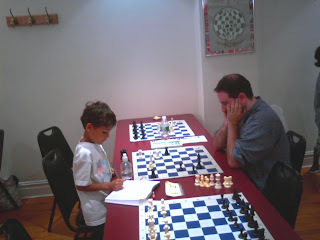 Kadhir Pillai lost to candidate master Michael Ellenbogen. 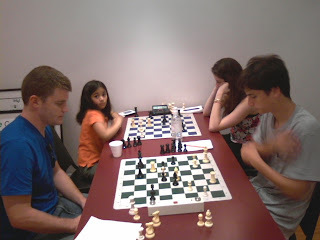 In the background, Reva Singh was defeated by my fourth-round opponent Anna Ginzburg. Last week, the U.S. 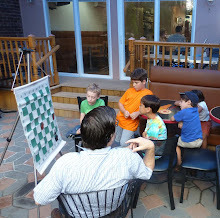 Chess School met at the Dean of Chess Academy in Branchburg, New Jersey. 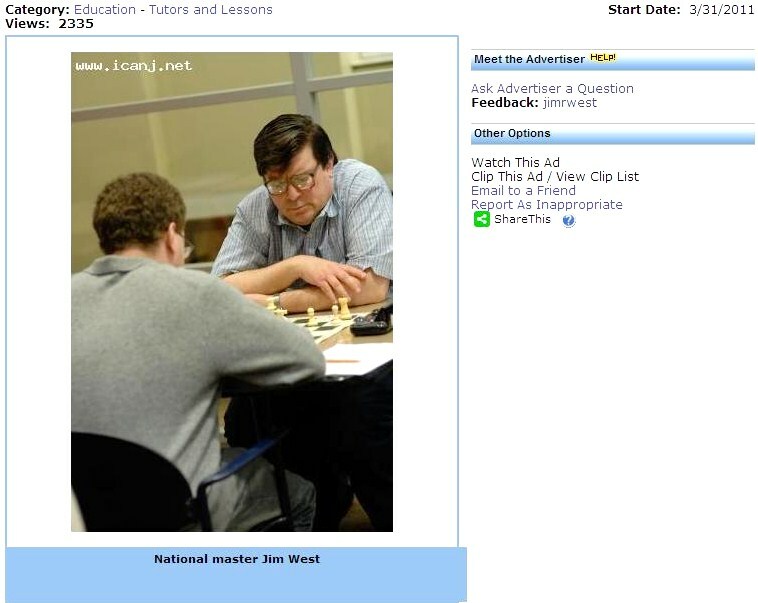 Susan Polgar has filed a lawsuit, claiming libel and slander, against Sam Sloan and the United States Chess Federation. 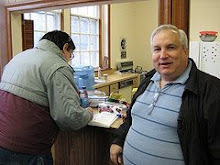 Here are Bill Goichberg's comments on Polgar's suit. After the opening moves 1.d4 Nf6 2.c4 e6 3.Nc3 Bb4 4.e3 b6 5.Bd3 Bb7 6.Nf3 Ne4 7.Qc2 f5, what began as a Nimzo-Indian Defense in the Rubinstein Variation has transposed into a position that could have been reached via the Dutch Defense. Following 8.O-O Bxc3 9.bxc3 O-O 10.Nd2 Qh4 11.f3 Nxd2 12.Bxd2 Nc6, the game has arrived at a well-known position. Let's take a look at how world champions Alekhine and Fischer won from it, playing the black pieces. Black has won a pawn. Alekhine wrapped up the victory by sacrificing material to penetrate White's position. 18.Re2 b5 19.Qb3 Qf5 20.Rfe1 Rab8 21.Bc1 a5 22.Re4 a4 23.Qd1 Rbe8 24.Qe2 c5 25.Be3 cxd4 26.Bxd4 e5 27.f4 d6 28.h3 Re6 29.fxe5 dxe5 30.Bc5 Rf7 31.Rb1 h6 32.Rxb5 Nd2 33.Rxa4 Qc2 34.Rb8+ Kh7 35.Kh1 Rf1+ 36.Bg1 Rxg1+ 37.Kxg1 Qc1+ 38.Kf2 Rf6+ 39.Ke3 Nb1+, White resigns. In Maurer-Donaldson, Liechtenstein 1994, White varied with 14.fxe4 e5 15.d5 Ne7 16.c5 Ng6 17.cxb6 axb6 18.c4 c6 19.a4 Qg4 20.a5 Nh4 21.Bc3 Rxf1+ 22.Rxf1 bxa5 23.Qf2 Ng6 24.Bxa5 Nf4 25.Kh1 h6, White resigns. A pawn up, Fischer now wove a mating net, despite the scarcity of material. 28.Re1 Nb3 29.Ba6 Nc5 30.Be2 a5 31.Bc7 a4 32.Bxb6 Nb3 33.Bd1 Rc8 34.Kf2 Nc1 35.Re3 Rb8 36.Bc5 Rb2+ 37.Kg3 Nb3 38.Bd6 Nd4 39.Bg4 Bxg4 40.Kxg4 Rxg2+ 41.Kh3 Rg1 42.e6 Nf5 43.Rd3 g5 44.Bg3 h5, White resigns. Rather than waste a tempo with his queen rook by 13.Rae1, White played more economically in Smyslov-Bronstein, Alekhine Memorial 1956. The game was drawn quickly after 13.Rab1 Ne7 14.a4 Ba6 15.a5 Nc6 16.axb6 axb6 17.Ra1 Na5, draw. In The Wall Street Journal, Garry Kasparov opines on Russia's invasion of Georgia. 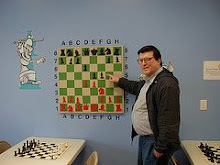 Playing in a game/60 Swiss today, I finished with a record of 1-0-3 at the Marshall Chess Club. My games follow. 45.Nc5+ Kf4 46.Nd3+ Kg4 47.Nb4 Kh3 48.Nxc6 Kxh2 49.Nd4 h4 50.Nxb5 Kg2 51.Nd4 h3 52.Nf3 h2 53.Nxh2 Kxh2 54.Kd3 Kg3 55.Kxc4 e2 56.Kb5 e1=Q 57.Kxa4 Kf4 58.Kb5 Qd2 59.b4 Qxc3 60.a4 Ke5 61.Ka5 Kd6 62.Kb5 Kc7 63.a5 Qc6#. 31.Ne3 d4 32.cxd4 Qxd4 33.Qc1 Qe4+ 34.Nc2 Qd3 35.a3 f6 36.gxf6 exf6 37.Qe1 Kf7 38.Kc1 h5 39.Nb4 Qd6 40.Qe4 Kg7, draw. 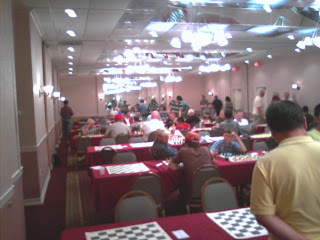 37.Kf6 Kd4 38.Ke6 b5 39.Kd6 c2 40.Kc6 a6 41.Kb6 Kc3 42.Kxa6 b4 43.Kb5 b3 44.axb3, draw. 61.Rh1+ Kd2 62.Rg1 Ke2 63.Rh1 Kd2 64.Rh2+ Kc1 65.Ka2 Kd1 66.Kb1 Ke1 67.Rh8 Kd2 68.Rd8+ Ke2 69.Rd3 Ke1 70.Ka2 Kf2 71.Kb3 Ke2 72.Rd8 Ke1 73.Rd7 Kf2 74.Re7 Kf3 75.Re8 Kf2, draw.